Belgium is a chocoholic's dream come true. 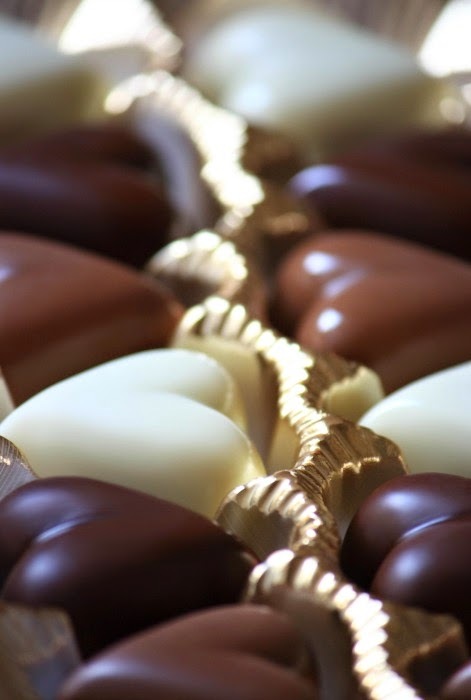 There are over 2,000 chocolatiers in Belgium with most of them being small independent chocolate makers. Chocolate shops are common with gorgeous handmade chocolates on display in the shop windows that are small works of art and almost too pretty to eat. In order for chocolate to be labeled "Belgian chocolate" it must be made in Belgium and chocolate making in Belgium is strictly regulated by law. The composition of chocolate must be 35% cocoa. Belgian chocolates are most known for their pralines which are like truffles. Belgian pralines are chocolates with a molded chocolate shell and a soft creamy ganache center. Jean Neuhaus invented the praline in 1857 when he covered some of the medicines in his pharmacy with a thin chocolate coating to make them more palatable. Today Neuhaus is a premier chocolate maker. Godiva, another famous Belgian chocolate maker, is the official purveyor of chocolate to Belgium’s royal court. Belgium produces 172,000 tons of chocolate each year and Belgians have the highest chocolate consumption rate in the world. The average Belgian consumes over fifteen pounds of chocolate each year. I think I've certainly done my part to contribute to that statistic during my visit!